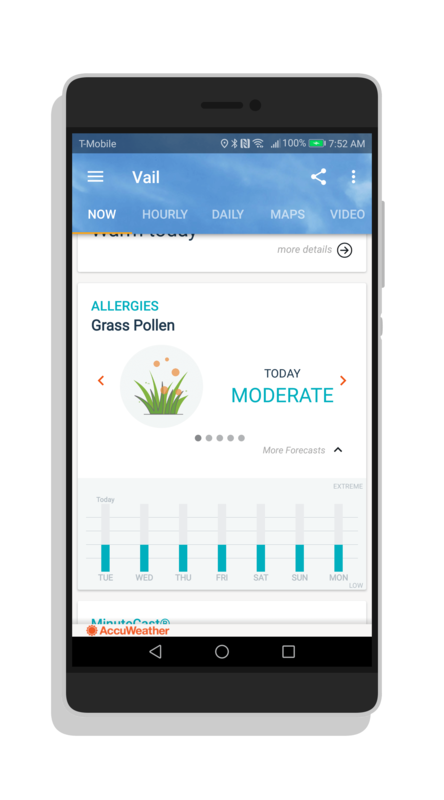 The AccuWeather Platinum app for Android, the pay version of the free app, has been updated today with a new 7-day allergy forecast. As a pane on the Now tab of the app, you can get not only details on the types of pollen that are in your area but can get a view of what is going to be in the air over the course of the next week. To get an idea of the types of pollen that are in the air for the day, just scroll through using the arrows on the Allergies pane to see things like grass, tree and Ragweed pollen in your area. If you have multiple cities that you track in the app, the Allergies pane will reflect the conditions for those locations too. AccuWeather Platinum for a while now but it didn’t apply to maps. Now it does so whether you have it set to go to the dark theme automatically at night or all the time, maps will now be dark too. The Platinum version of the app is a one-time cost of $2.99. You can download it from the Play Store. If you have the app already, you will get the OTA update to this new version over the course of the next day or two.